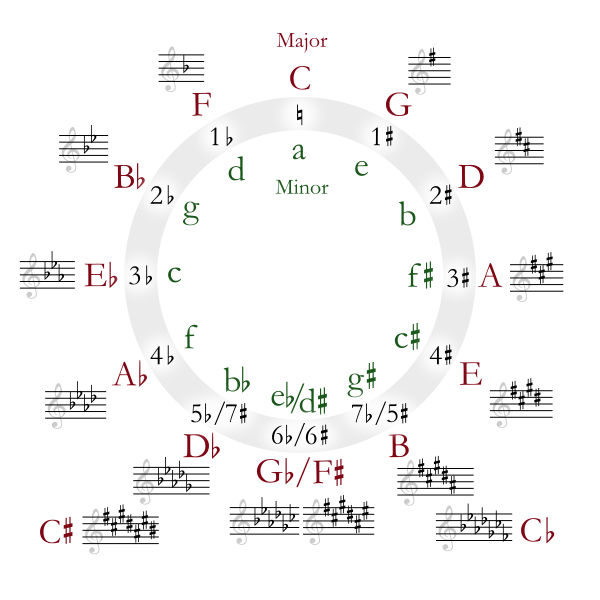 I've been reading up on the circle of fifths and it seems more complicated than sharps and flats. Could you clear this up for me? Russ, thanks for your question. I've been meaning to clear up the whole circle of fifths thing for a while now. I hope I can help to clarify its main practical functions for guitarists. So here we have all the diatonic major keys in the outer ring (C, G, D etc.). And in the inner ring we have the minor keys (Am, Em, Bm etc.). The first relationship the CoF can teach us is that between the relative major/minor keys. As you can see, the relative minor sits directly below the major. For example, Am is the relative minor key of Cmaj. Cmaj is the relative major key of Am. The scale of the major key (e.g. C major) uses the same notes as its relative minor key scale (e.g. A minor). For example, C major pentatonic uses the same notes as A minor pentatonic. The B natural minor scale uses the same notes as its relative D major scale. This means you can use the relative minor scale pattern to extend your major scale pattern when playing in major keys, or vice versa. However, it's far more effective to learn to see this major/minor relationship on the fretboard. The relative minor chord and scale is always three frets below the major. The relative major chord/scale is always three frets above the minor. The other function served by this major/minor relationship is relative key changes (modulation). This means you can resolve your chord progression to the relative key for a different sound. For example, I could start in the key of A major, but resolve to F# minor. Or vice versa. Relative key changes are the most natural sounding type of modulation, because as mentioned before, the relative keys use the same notes/scale. Another relationship the CoF teaches us is that between the chords of a given diatonic key. Most songs you'll hear (e.g. pop and rock) are written (whether intentionally or not) around the diatonic harmonization of a major or minor scale. This harmonization creates a "chord scale" - one chord built on each of the scale's notes. Why do all these chords work so well together? Because they all contain notes from the parent scale - C major. So learning this relationship might help you with writing chord progressions that flow naturally. However, you should try to substitute and alter chords occasionally. More on that another time. It'll also tell you which chords make up a given diatonic (common) key, so you know which scale they are part of. For example, let's say you were jamming the blues in E major. You might know that blues typically uses the I IV and V (1 4 and 5) chords. Using the circle of fifths, you can learn what these chords would be for each key. So again, the 1, 4 and 5 chords are grouped together with the tonic (key) in the center. The other chords (VI, III and VII) will also work naturally in that minor key, because as we now know, they all use the same notes as the parent relative scales (C major / A minor). Note that it's common to make the v chord a major V chord, as it carries more harmonic weight (sounds better!). Here's an interesting use of the circle in terms of changing to a new key and scale. We do this by making the V chord (the chord to the right of the I chord) the new tonic/I and therefore the new key center. Let's say we started in the key of C major. We know the chords and we know that A minor is its relative minor key (the vi or 6 chord). So we used D major as a "pivot chord", known as a secondary dominant, to move into our new key of G major. We then used chords from the G major key to reaffirm it as the new key center. So when playing in major keys, there's a strong link into a new key just to the right of the V chord. The V chord of the original key becomes the new tonic (I). This type is more useful for those learning standard notation, as it tells us the number of sharps and flats in a given key signature. I've always placed more emphasis and time on learning how notes relate to one another on the fretboard and by ear than thinking in purely theoretical terms. Even if you mastered everything the circle of fifths can possibly teach you, you'd still have to work on visually translating those relationships to the fretboard and internalize them aurally. Simply memorizing notes and sharps/flats will only get you so far. You need to be able to hear how they harmonize with other notes and see how such harmonizations form movable patterns (e.g. scales) on the fretboard. That way, you don't have to waste hours of your time learning the individual notes for each of the twelve keys. Instead, you can learn in patterns (e.g. intervals) and simply move those patterns to the appropriate fret for a different key. However I hope I've clarified how the circle of fifths can help you with song writing,connecting a key and scale to a bunch of related chords and vice versa. Thank you Thank you Thank you. I been trying to work with CoF, but never got this far. Now I will be able to get more out of it. Thank you once again. Great run down on a powerful tool that's often not explained in a practical way. Thanks for the solid work. Very very useful informatin and substantial guidance. I'M learning Casio cts 860 in, but your this article on guitar has widened my basic knowledge of scales and mechanism of circle of fifths. Thank a lot. God bless you with all the success and happiness in your life. I can not figure out your numbering in the middle section "What about minor keys? Same three-segment relationship".